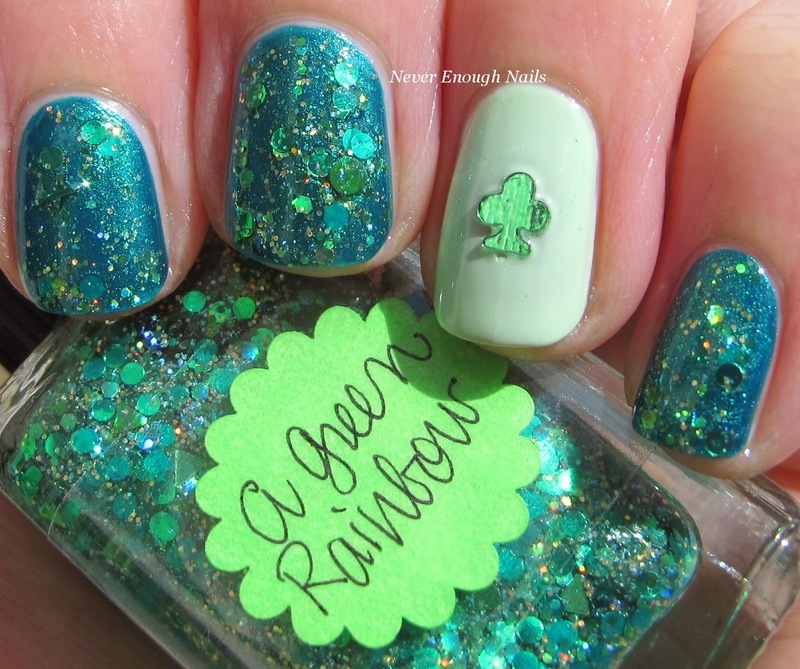 Never Enough Nails: Happy St. Patrick's Day- Lynnderella A Green Rainbow! Happy St. Patrick's Day- Lynnderella A Green Rainbow! Happy St. Patrick's Day!!! I am running around doing tons of shows today, but I HAD to quickly show you my St. Patrick's Day mani. I am wearing the STUNNING Lynnderella A Green Rainbow over Sally Hansen Emerald Express, with an accent nail of OPI That's Hula-rious!. 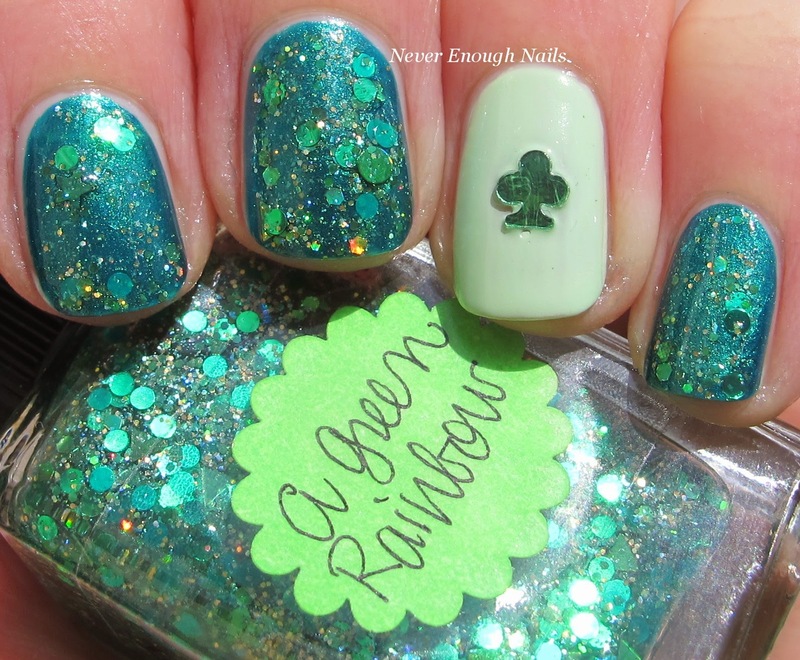 Lynnderella aptly describes A Green Rainbow as a "multiglitter that contains assorted holographic and metallic green glitters featuring three-leaved shamrocks in a clear base". 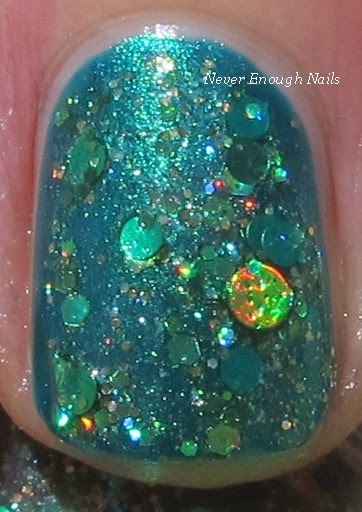 The holographic glitter in this is really eye-catching and stands out amid the green. I had a bag of holographic shamrock glitter from some other polish, so I used that for the accent nail. There are also shamrocks in A Green Rainbow itself, but since I didn't want any of the other glitters on my accent nails, I thought it was easiest to use the loose ones. This is just one coat of A Green Rainbow over two coats of Emerald Express. I used two coats of That's Hula-rious!. A Green Rainbow had plenty of glitter and was very easy to apply. Hope you all have a great St. Patrick's Day!!! Lynnderella A Green Rainbow and other Lynnderella polishes are available at lynnderella.com and lynnderella.storenvy.com. For more information about upcoming collections, check out lynnderella-lynnderella.blogspot.com. I love this so much Ananka! I've been wearing it for days now and still can't stop staring at it!